Actors Co-op has announced its fourth show in its 2014-2015 season (and 23rd year of producing theatrical excellence in Los Angeles!) 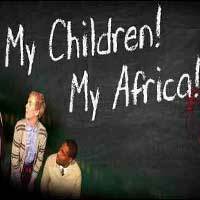 with Athol Fugard's spellbinding MY CHILDREN! MY AFRICA!, produced by Catherine Gray and directed by Inger Tudor. MY CHILDREN! MY AFRICA! will preview tonight, March 18 and Thursday, March 19 at 8pm and will open on Friday, March 20 at 8pm and run through Sunday, May 3 at the Actors Co-op Crossley Theatre, 1760 N. Gower St. (on the campus of the First Presbyterian Church of Hollywood) in Hollywood. In Athol Fugard's tale of friendship and racial tension, a schoolmaster in a small South African township describes hope as "a dangerous animal." Can he combine the talents of a black male student with a white female student on an educational journey in the midst of apartheid? ATHOL FUGARD (Playwright) is a South African playwright, novelist, actor, and director. He is best known for his political plays opposing the South African system of apartheid. Fugard was born in Middelburg, South Africa in 1932. He was brought up in Port Elizabeth, South Africa with English as his mother tongue. Fugard organized several theater companies over his career including The Circle Players, The Serpent Players and The Fugard Theatre in Cape Town. He publicly supported the Anti-Apartheid Movement from 1959 - 1994, leading to government restrictions on him and police surveillance of him and his theatre. Because of this, his plays have been published and produced outside of South Africa. Other plays include Blood Knot, The Coat, "Master Harold"...And The Boys, The Road To Mecca, Exits And Entrancesand The Train Driver. Fugard made his film debut as a director in 1992 when he co-directed the adaptation of his play "The Road To Mecca". Also, the film adaptation of his novel "Tsotsi" won the 2005 Academy Award for Best Foreign Language Film. Fugard is also the recipient of many awards and honors. Fugard is an adjunct professor of playwriting, acting and directing in the Department of Theatre and Dance at the University of California, San Diego. INGER TUDOR (Director) is an actress, former litigation attorney and public speaking coach who enjoys putting on her directing and producing hats from time to time. A graduate of Harvard College, Harvard Law School and the London Academy of Music and Dramatic Art, Inger has served as director, assistant director and producer on a number of productions, both in New York and Los Angeles. Some of her favorite directing credits include LOCAL STORY (Theatre of NOTE), THE VIEW FROM HERE (The Actors Workout Studio), and her very first production, THE COLORED MUSEUM (HLS Drama Society-Best Director award). The Cast of MY CHILDREN! MY AFRICA! will feature (in alphabetical order): Rodrick Jean-Charles, Aaron Jennings and Maurie Speed. MY CHILDREN! MY AFRICA! has assembled an award-winning design team. Set Design is by Mark Henderson and Tim Farmer; Sets To Go. Lighting Design is by Bill E. Kickbush. Sound Design is by Warren Davis. Costume design is by Vicki Conrad. The Dialect Coach is Jill Massie. The Stage Manager is Amanda Rountree. MY CHILDREN! MY AFRICA! is produced by Catherine Gray. MY CHILDREN! MY AFRICA! will preview on Wednesday, March 18 and Thursday, March 19 at 8pm and will open on Friday, March 20 at 8pm and run through Sunday, May 3 at the Actors Co-op Crossley Theatre, 1760 N. Gower St. (on the campus of the First Presbyterian Church of Hollywood) in Hollywood. Performances are Friday and Saturday evenings at 8:00pm and Sundays at 2:30pm (with two Saturday Matinees scheduled for Saturday, March 28 and Saturday, May 2 at 2:30pm). Ticket prices are $30.00 for all Performances. Seniors (60 and over) - $25 and Students - $20.00 (with Student Rush Tickets available on Friday evenings excluding Opening night on a first-come, first served basis, subject to availability). Previews are Free to the Public. There will be no performances over Easter weekend (April 3- 5). Group rates are available for parties of 6 or more. Tickets may be purchased by phone at (323) 462-8460 or visit www.ActorsCo-op.org.